The Fed has been wrong about growth lately in their forecasts, and wrong in a very bad way. The Fed forecasts have not yet taken into account fundamental changes in individual behavior. It would not be a surprise that such forecasts were wrong during or in the immediate aftermath of the crisis, but to still be so wrong at this point is worrisome. What is the problem? People are scared. The future is uncertain. For the time being uncertainty has people scared. Uncertainty still represents a profit opportunity in many, if not all, situations, but there is a larger group of people looking for the sure thing now than in the past. Make no mistake, this is a significant change in behavior. After past crises or disasters we saw the American consumer brush off fear of the future and go out there and buy. You might think increased realization of risk in the economy would encourage people to spend more now because you might not be here later. That typically has not been the case though. After the Great Recession though, people are genuinely afraid about what the future holds for them. Is it because the crisis hit nationwide? Is it because the crisis involved housing? Is it the persistence of high unemployment? All these and many others likely contribute to the problem, but there seems to be something more. Let’s bring this back to policy now. What do you think the biggest source of uncertainty facing the economy is right now? If you said the Fed taper you are wrong. That is now a symptom more than a cause. The fiscal picture still dominates the scene as far as risks facing the economy. The coming fiscal debate over the debt ceiling has the potential to inflict serious pain on a fragile economy. This was reason enough for the Fed to wait on the taper. That and the data still provide a mixed picture of an economy in recovery. The U.S. fiscal house is a mess, make no mistake. What continues to annoy me is the false pretenses of the debate. 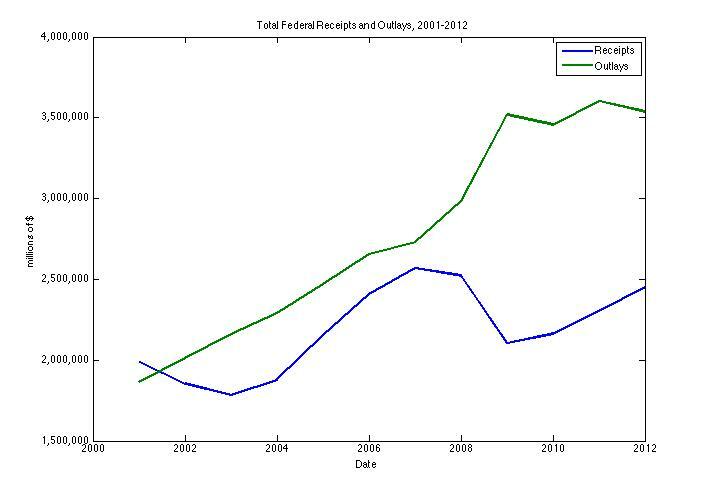 Neither party is truly interested in righting the fiscal ship. Democrats do not want this because they are afraid it will force spending discipline on them. Republicans do not want this either because it will force them to admit that tax revenue increases are needed to restore fiscal balance. Why are tax increases needed? I continue to maintain that there are not enough elected officials that will cut spending enough to restore a balanced budget at current tax levels. It just will not happen. Here is where we stand after the last decade. The source is the OMB. So let’s add a piece to this. 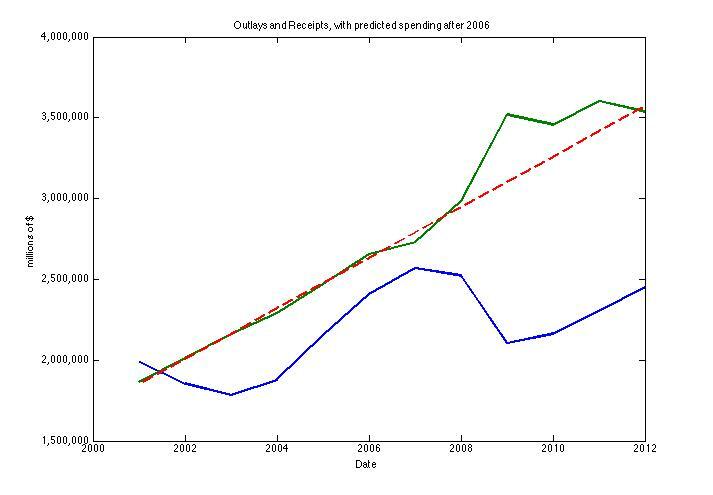 I looked at federal spending from 2001 to 2006 and pulled a simple linear time trend from that period and then projected it forward to the end of the full sample. I added it as a red line in the next graph. Okay, so all that arguing and brinkmanship we saw over the last year or two, just barely got us below where the trend in spending would take us anyway. That is hardly the fiscal progress and big thinking that either side promised over the last few years. This is why the Fed held off and decided to continue the bond buying program. They see the impotence of fiscal policy authorities to arrive at any substantive change. They see that the two sides cannot even discuss matters with any sense of reality about them. We need a bigger debate about the course of fiscal policy. What I fear we will get is more of the same, a continued effort to create “show” votes to put the party opposite on the spot for voting for or against something. Always with the promise of different policy ideas once there is a majority of this party or that party in office. A simple time trend based on data from the first six years of the George W. Bush presidency says we are currently at the same place we would have been anyway, with or without a crisis and any other issues we dealt with in the last 10 years. This might be the scariest graph I’ve created in a long time.